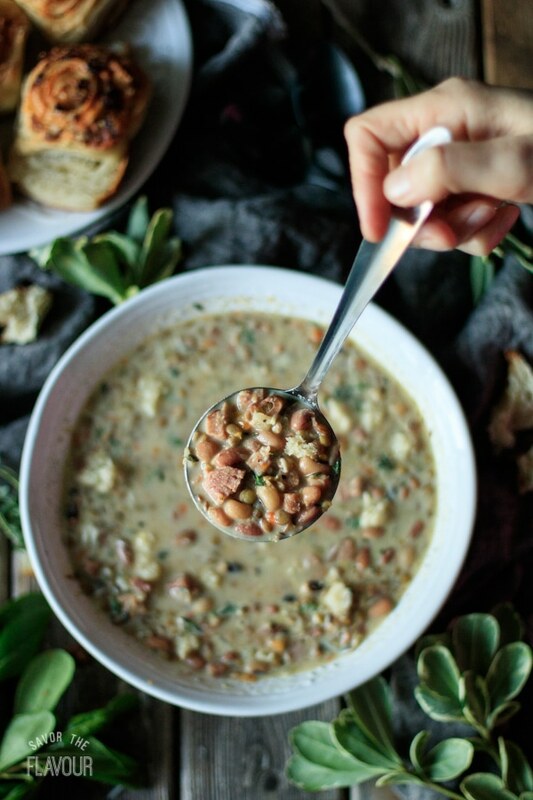 Give leftover ham a boost with this easy, creamy stovetop ham and bean soup! It’s a budget friendly, gluten free dinner recipe that’s packed with flavor, protein, fiber, and nutrients. It freezes well and tastes awesome with fresh bread. Are you looking for a fresh new recipe to use up leftover ham? 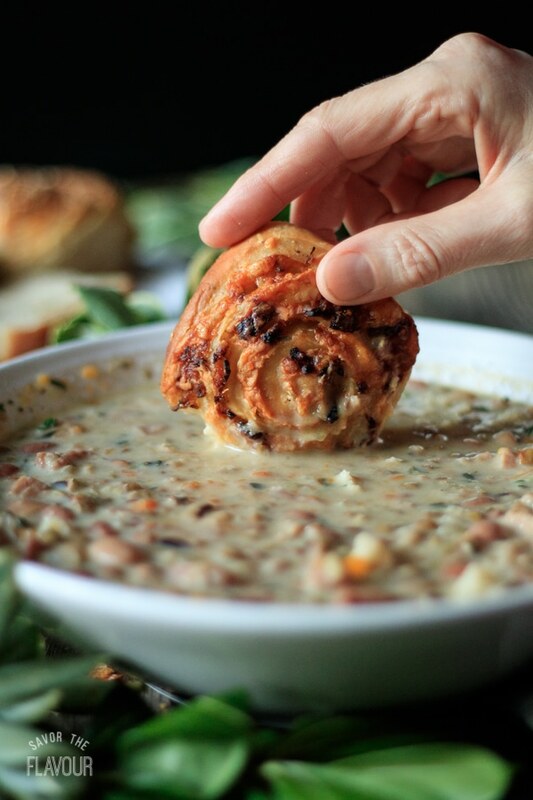 This ham and bean soup could be the answer to your prayers. 🥣 It’s economical, healthy, and really easy. Plus, it doesn’t need a ham bone. The hardest part is chopping up the veggies and ham. Once that is taken care of, the rest is dump, pour and stir. Simple, right? 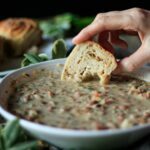 You do need some patience as the dried beans soak overnight, and as the soup simmers for two hours, but what a small price to pay in order to taste this hearty soup. 😋 Garnish this ham and bean soup with fresh thyme, grated Romano, or freshly cut bread cubes for extra yumminess. In the evening, rinse the three kinds of dried beans. Put them in a large pot, and cover with water. Let the pot boil for 2 minutes. Turn the heat off, and slide the covered pot off the heat. Let sit for overnight. In the morning, drain the beans. Dump them back into the same pot and cover with water. Let the pot boil for 2 minutes. Turn the heat off and slide the covered pot off the heat. Let sit for at least one hour. Check the beans to see if they are soft enough to start the soup. If they aren’t, repeat this step. Drain the beans and rinse in a colander. In a large soup pot, pour in 6 cups of chicken stock and 4 cups of filtered water, the onions, carrots, celery, diced ham, and the bay leaves. Stir, then bring to a boil. Reduce to a simmer and let the soup cook for an hour. Add the beans and the 1 cup of lentils. Stir and add the salt and pepper to taste. Add 38 sprigs, or a handful, of fresh thyme, reserving the extra 6 sprigs for garnish. Bring the soup to a boil, then simmer for another hour. Take out all the thyme stems and the bay leaves. Remove the soup from the heat. Stir in the cream. Taste, and adjust seasonings, if needed, by adding more salt or black pepper. Serve warm. Garnish each bowl with fresh thyme leaves and a few cracks of black pepper. Other garnishes could be freshly grated Romano cheese or freshly cut bread cubes. The total time for this recipe doesn’t count the boiling or soaking of the dried beans.